Salesforce has great out-of the-box functionality, but there will be a time when you need a more custom CRM solution. Maybe you want to better segment donors with a custom field or create a new record when a specific action occurs. 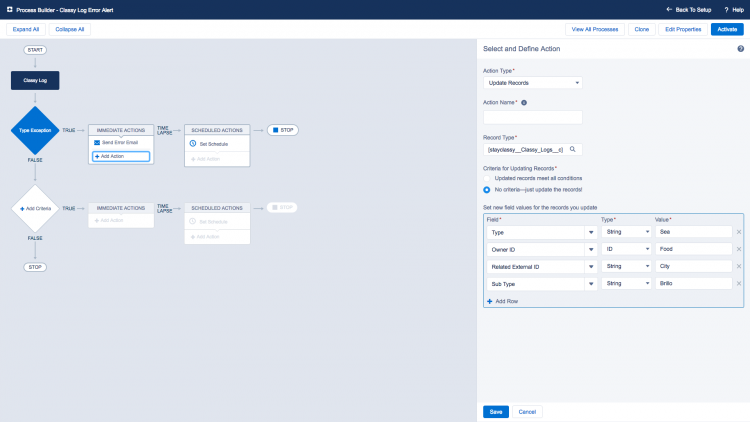 One way to approach customizing Salesforce is to use Process Builder, a built-in tool that can automate complex tasks with a few clicks and no coding. Process Builder’s simple interface. You can define triggers, objects, actions, and results with just a few clicks. Is Process Builder Right For You? It might be. Salesforce created Process Builder to make custom CRM implementation easier for their users. The key word here is “custom.” A custom solution should only be used for a very unique situation. In many cases, your organization is not alone in its needs from Salesforce. Chances are someone out there already uses it similarly and there’s a good chance a solution already exists. In fact, it might exist within Salesforce or a commonly used package like the Nonprofit Success Pack (NPSP). Remember to include the word “Salesforce” in each of your searches. It’s fine if the solution you find is a bit too technical for your organization. At the very least, you’ll discover whether what you’re looking for is even possible and, if yes, how difficult it will be to set up and implement. I find new Salesforce or Salesforce app functionalities on a daily basis. Why build a custom solution when it’s built-in and you can count on it being used daily by thousands of other users and supported directly by Salesforce? For example, did you know Salesforce has a built-in contact merge feature? Did you know Salesforce has a recycle bin? Did you know Nonprofit Success Pack has settings to automatically create payments, refresh rollups, and rename opportunities? All of these are settings or features that probably be recreated to varying degrees with Process Builder, but clicking a checkbox for a Salesforce supported setting is much simpler and more reliable. If it’s not built in, maybe there’s an app for that. Check out Salesforce’s AppExchange and apply some of those Google search terms you tried out before. When you’re talking data, it’s always a best practice to use a test environment, also called a sandbox. Sandboxes are copies of your production settings, apps, and even data depending on the type of sandbox you choose. “If it’s your first time setting up a sandbox, attend a Salesforce webinar on the subject or jump into a Trailhead unit to help get you started. In a previous article, I talked up Salesforce’s awesome learning platform, Trailhead. 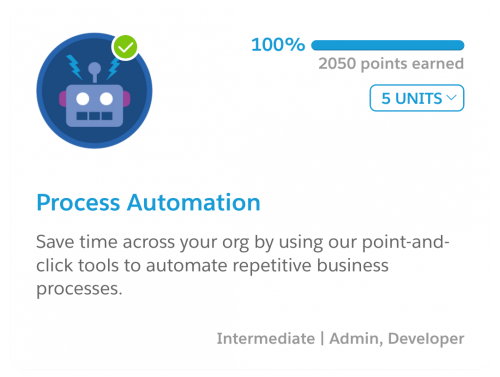 There is an entire module on process automation (pictured above) and even a dedicated, 20 minute lesson about Process Builder. This module will jump start your discovery process, but the best next step is build a process yourself. If you’re struggling to reference a particular Salesforce record as you build a process, try switching between the record’s 15 and 18 digit Salesforce IDs. How Can I Use Process Builder? Example: Update a custom designation field based on the Classy Designation field. Example: Create a custom object record from another package every time Classy for Salesforce creates a new opportunity record. Example: Notify your Director of Development when a contact’s Total Raised field is greater than $1,000. If you’ve done your due diligence with research and testing, you’ll be much more confident about answering that question. This is a guest post by Julian Joseph. Julian started as a Classy client and now heads up Classy for Salesforce support. He enjoys making repetitive process more efficient and loves all objects standard or custom.